This USA-shaped, plywood display offers a decorative way to showcase a bottle cap collection. From Adirondack ales to West Coast IPAs, craft beer aficionados love to discover new favorites from breweries across the country, and each bottle cap is a tiny trophy of those hoppy triumphs that deserves to be displayed. Crafted from Baltic birch plywood, this USA-shaped display board offers cap collectors an alternative to throwing those little works of art in a plastic cup or cluttered drawer. The openings have small teeth that fit the crimped edges of caps to hold them securely, and the board sports additional holes to hang the whole display on a camp, dorm, or man cave wall. Made in Tampa, Florida. 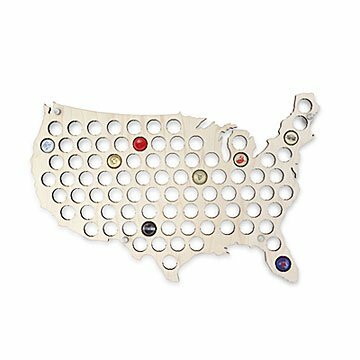 Pair your Beer Cap Map USA with our Dent Free Bottle Cap Opener. Fun and Challenging Birthday Gift! Purchased this for my husband (for whom gift buying is VERY difficult) for his birthday and he LOVES it! Started him out with a 12pk of singles from various states and he is enjoying the challenging of finding and trying new beers to correspond to the states/ regions on the map. Turning out to be a colorful, interesting piece of art on his home office wall! It's a great item for college graduation! Good size! I got this map for my boyfriend, who's a big craft beer fan. He loved it, and altogether it seems reasonably well made. However, I do wish that the caps more closely aligned with the states themselves. Loved it and was a great gift. It's a Christmas gift for my son-in-law's new beer bar. He can mount it on the wall in the bar; then on his website he can invite out-of-town visitors to bring a beer cap from a brewery in their home state when they come to NC. Needed a gift for someone hard to buy for - he loves beer and they needed decor for their mountain house so this was the perfect solution! Well made and well packaged - kept the item safe without being too much. Something my husband said he would like. Great addition to my brothers garage or any man cave, great conversation piece and made very well!! Awesome gift for any occasion. My hubby loved it. Am planning to frame it and use it as decoration when its full of beer caps.